To be honest, I don't really buy anything from true 'drugstores'; I am more of a 'drugstore section of Target and Walmart' gal. However, this is a fun Friday Five for me, because 90% of my make up and beauty products come from drugstore sources, rather than higher end brands. This "beauty products" 5 is a bit broad too, i.e. not just makeup, not just skin care. It's just the 5 things I use literally every day and love. So whether your a drugstore make up girl too, or you prefer department store or independent brands, give these guys a shot sometime when your traveling or need a quick fix! I would be telling you about my 5 favorite Sonja Kashuk make-up products, but she recently switched to exclusively providing tools and accessories, rather than products. It was so sad!!! I bought everything I could and am still working off my stock supply. However, I also love her brushes and bags. I know you're theoretically supposed to swap your make-up brushes like, more often than every few years (oops! ), but I CANNOT stop using my Sonja Kashuk bamboo brushes, even though she has come out with other new, fantastic options. I've got my eye on these. They are high quality, well priced, and can resiliently stand the throw-in-my-bag-or-car-or-leave-in-hot-room-squished-underneath-other-junk beauty life I live. I've been carrying the same SK make-up bag for 5+ years as well. This is the closest version to mine that is in stores right now. So many pockets and storage and high quality bang for your buck. Sonja Kashuk, I'll try anything you make! Alright, here's the story on this. I've always been a usually-get-my-make-up-off-before-bed kinda sometimes-lotion-at-night good SPF user in my life. Then last August I turned 26, and all of a sudden I'm like ?????? Do I need to care more about my skin routine ????? What is this tiny line on my forehead that won't go away ?????? My mom has always used the online forum Beautypedia to weigh beauty products before purchasing. There are a lot of expert sources out there to review products, but I swear by Beautypedia! I've definitely been disappointed in products I use I've bought from there, and I don't always play by her rules, but most of the time, I do. (She's really big on SPF in products, FYI, which is why a lot of my fave things don't always rate high). 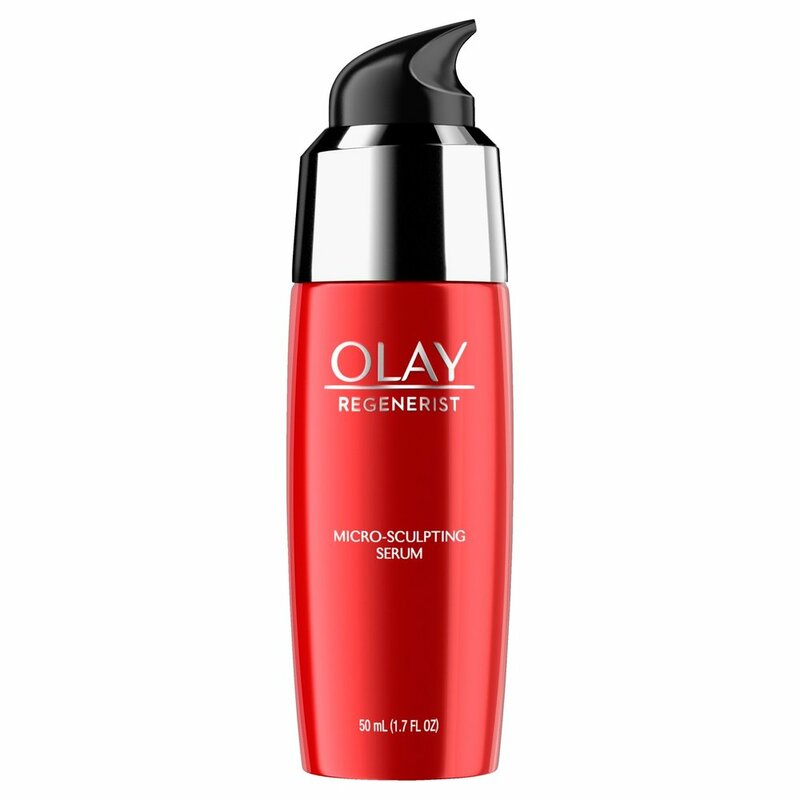 So - enter my Olay Serum - I did a good bit of research for a budget-friendly serum for 20-somethings. I started using it in January of this year, and I've been so pleased thus far. To me, it's the lazy gal's guide to feeling more on top of her skincare game. Pro Tip: If you set this up on a Subscription service online from Target, you save $$$ from buying in person or just buying in single quantities online (around $5.00 per bottle savings from buying in-store!). Nothing super magical to say here, except I am obsessed with and have been using this CoverGirl LashBlast Volume Mascara so long that I cannot remember what I used before it. I've tried various other mascaras over these years (aka free samples and/or gifts and/or other drugstore brands), but none seen to compare with my fat, little orange tube of glory. ALWAYS in Blackest Black/Onyx and NEVER Waterproof (Simply preference). I always keep an empty tube on hand as well for separating my lashes. Is this a beauty product? Unsure - but for the sake of this, I'm calling it one. This Gillette Daisy Disposable Razor is THE only razor I will use. It is the only razor (almost) all of the family uses and has always used. They come in a 12 count and are perfect. Use a few times, toss. I keep one in my shower, a fresh one in my overnight/weekender bag, one in my workout bag. Who needs all the frills when it comes to something like shaving? This gets the job done at the right price point and can be bought pretty much anywhere that sells toiletries! All Hail Daisy Disposable Razors. Guys, if you don't already use CoverGirl's Jumbo Gloss Balm, you are missing out. While I do LOVE Clinique products (about as far as I branch out into department store brands), specifically the Clinique Chubby Stick in this case, where I am in my life, it just doesn't work for my budget. Cue about 5 years ago when I discovered my version of the "look for less." I mean y'all, these colors POP, and they STAY ON. And they are a third of the price. SOOO worth it. So...what do you think? Do you love any of these drugstore products too? Why? $5 gift card when you spend $20 on beauty & cosmetics at Target!